As the Earth continues to heat up, so have calls to dramatically reduce carbon dioxide emissions to avoid catastrophic climate change. But many experts say that even if all emissions stopped tomorrow, the planet would continue to warm and seas would continue to rise. A key issue is that atmosphere would still be clogged with 200 years’ worth of human-produced carbon dioxide. “The question is, what do we do with all this excess CO2 in the atmosphere?” said Noah Deich, executive director and co-founder of the nonprofit Center for Carbon Removal. A new application of old technology may be the answer. 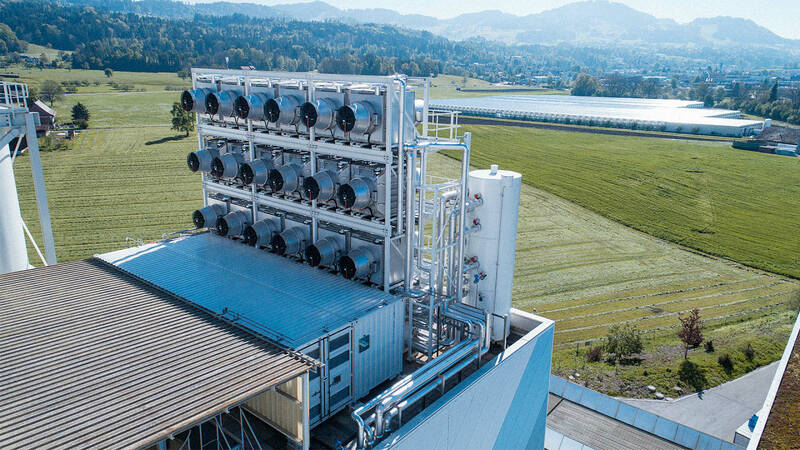 “Direct air capture” that removes the gas from ambient air has possible since the 1940s, but — at a cost estimated in 2011 to be as much as $1,000 per metric ton of CO2 — it has long been viewed as too expensive to be practical. David Keith, the Gordon McKay Professor of Applied Physics at the Harvard John A. Paulson School of Engineering and Applied Sciences (SEAS) and professor of public policy at the Harvard Kennedy School, thinks it can be done for a lot less. He and his colleagues estimate that their company, Carbon Engineering, could capture CO2 for between $94 and $232 per metric ton. In the journal Joule, the team outlined the material and engineering costs of their system — the first time the costs of a commercial direct-air-capture process have been published. The paper could have major ramifications across the industry. “Until now, basically no one in the industry has published an open-book number that will give credibility that direct air capture costs less than the $500 to $1,000 per metric ton that has been estimated,” Deich said. Keith co-founded Carbon Engineering in 2009, when direct air capture was still on the fringes of industrial climate solutions. Carbon Engineering’s goal is to use direct air capture to produce carbon-neutral fuels and converting carbon-free energy into high-energy fuels for vehicles such as planes and barges, which are difficult to electrify. The Carbon Engineering team’s approach differs from their few competitors in the field. Artist’s rendering of Carbon Engineering’s air capture design. This unit would be one of several that would collectively capture 1 million metric tonnes of CO2 per year. In the Carbon Engineering system, a remodeled industrial cooling tower containing a liquid hydroxide solution captures CO₂ and converts it into carbonate. The carbonate is then converted into pellets in equipment originally created to extract minerals in water-treatment plants. Finally, the carbon pellets are heated in a kiln originally designed for roasting gold, and transformed into pure carbon dioxide gas, which can be turned into synthetic fuel. Keith’s team worked directly with commercial suppliers of each of piece of repurposed equipment to design tests, engineer alterations, and develop cost estimates to adapt the hardware for a commercial direct-air-capture plant. With that cost breakdown, direct air capture — especially direct air capture that can be used to make synthetic fuel — may look less exotic and more attractive to investors and policymakers. In addition, the technology is location-independent, which should add to its allure, said Joe Lassiter, retired Senior Fellow and Senator John Heinz Professor of Management Practice in Environmental Management at the Harvard Business School. To date, Keith and the Carbon Engineering team have raised about $30 million. The next step is to raise funds for a plant that can deliver fuels to market, which depends on finding a renewable power supplier who wants to supply high-capacity power at a low price and incentives for low-carbon fuels. “I hope this paper will launch 1,000 master’s students to figure out how to create an even better future using this technology,” said Friedmann.